www.janetcharltonshollywood.com Want more details? Visit my bio and click on link! 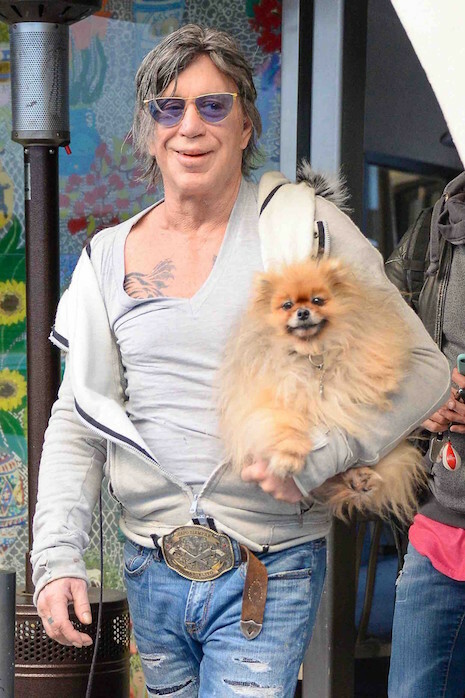 » Blog Archive » IS MICKEY ROURKE IS STARTING TO LOOK LIKE HIS DOG? Mickey Rourke brought along his beloved pooch for Christmas Eve lunch at Caffé Roma with his buddies. He can be forgiven for a multitude of fashion offenses because everyone looks better with a dog. Really. Mickey has done a lot of bad things to his own appearance, but he actually looks cute because he and his dog have the same little smile. It would take stadium filled with dogs to even remotely improve his looks. Is tragic and sad what he has had done to his face. I agree 9n the wig. He needs to ditch it. Ughhhhh ! Why would any restaurant let him in? He appeared to have decent features in the 1980 movies but sometime after that it looks like he must have linked up with a far-sighted plastic surgeon. Carrying a little sissy dog around like he is Paris Hilton ? What the heck? Makes me wonder if he has some wigs, evening gowns and pearls that he might like to try on every now and again?